Hydroxyzine (sold as Vistaril, Atarax) is a first-generation antihistamine of the diphenylmethane and piperazine classes. It was first synthesized in 1956 and was marketed by Pfizer in the United States later the same year. It is still in widespread use today. 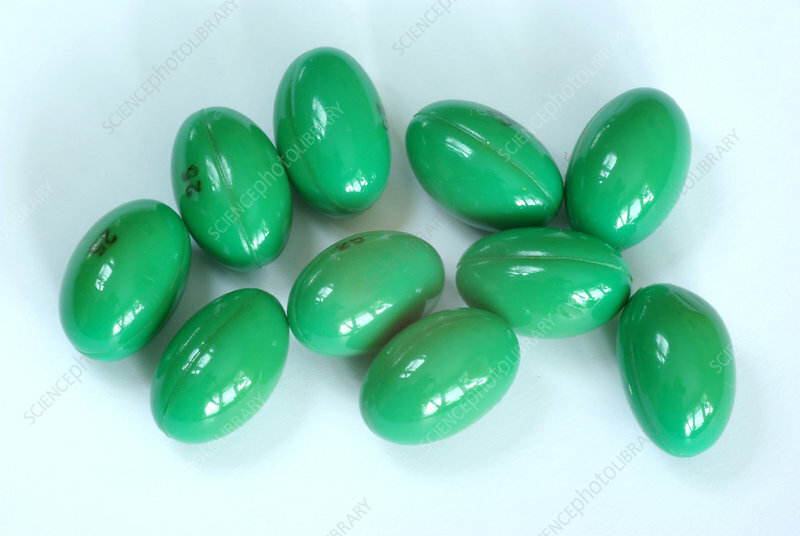 The form of green soft caplets (25 mg Hydroxyzine HCl) shown comes from the turn of the century, Hydroxyzine has strong anxiolytic and mild anti-obsessive as well as antipsychotic properties. Because of its antihistamine effects it can also be used for the treatment of severe cases of itching, hyperalgesia and motion sickness-induced nausea. Hydroxyzine is both an antihistamine and anxiolytic and its use as a tranquilizer is especially common in dentistry. It retains some popularity in obstetrics. The drug is available in two formulations, the pamoate (Vistaril, Equipose, Masmoran, and Paxistil) and the dihydrochloride or hydrochloride (shown) salts (Atarax, Alamon, Aterax, Durrax, Tran-Q,.